As we looked out on Plaza del Pilar, we instantly knew that we hadn’t allocated enough time to explore Saragossa. 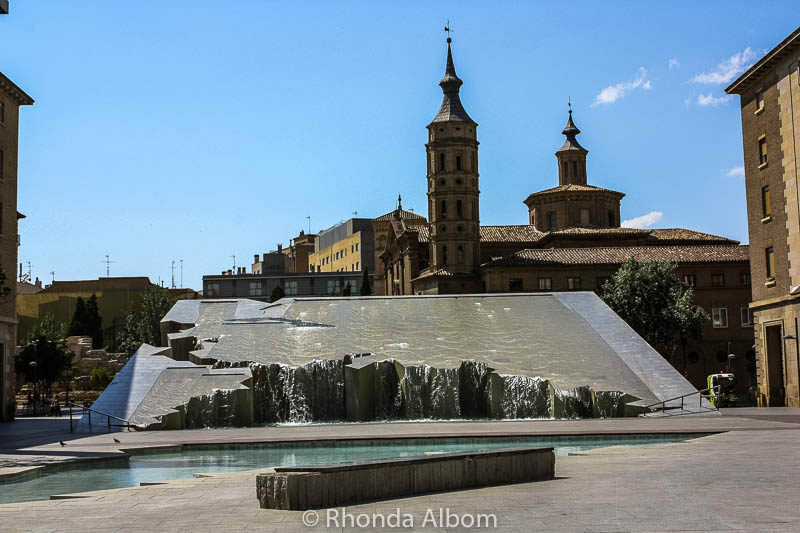 Like many visitors, we came to this Spanish town to see El Pilar, but even the plaza had so much more to offer. 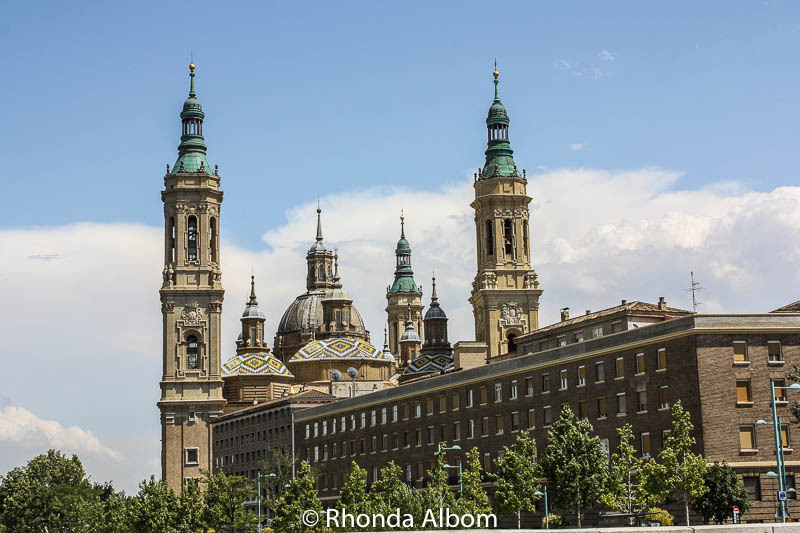 Saragossa (Zaragoza in Spanish), is a city of significant religious importance. 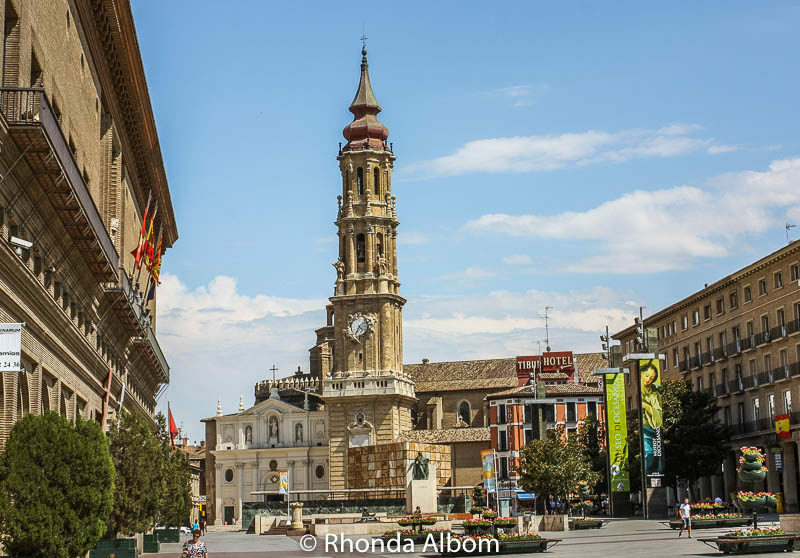 Located inland in the northeast portion of the country, Saragossa is the capital of Spain’s Aragon region. Local legend tells us that Saint James the Apostle came to Saragossa to spread Christianity. As he prayed one day in 40 AD, an apparition of the Virgin Mary appeared to him. She gave him a 39 cm tall statue of herself and a pillar made of jasper. Following her instructions, he built a small chapel on the spot, thus creating the first church dedicated to the Virgin Mary. El Pilar is not the original church on this location. The church has been rebuilt many times, each time increasing in grandeur. 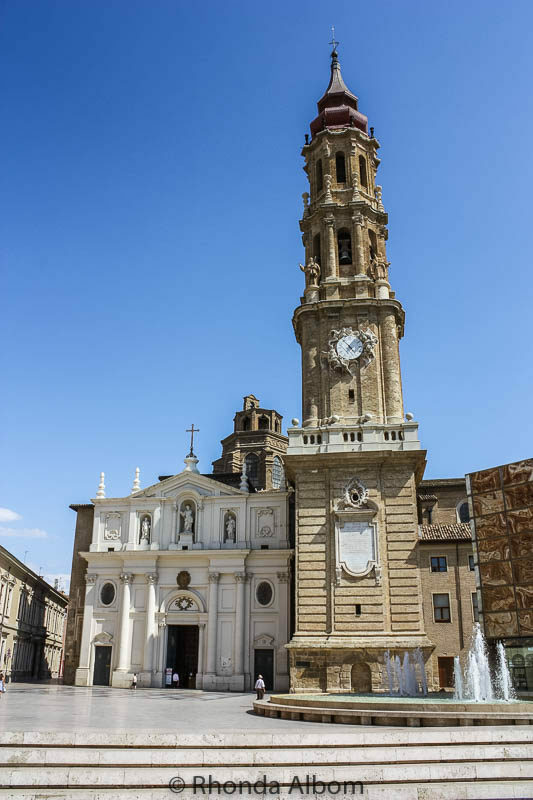 The current Basilica of Our Lady of the Pillar (or just El Pilar) was designed in 1681 and remodelled in the 18th century. Construction on the towers finished in the early 20th century. Thousands of pilgrims make their way here every year to kiss the small stature. For many, it is a stop on their pilgrimage to Santiago de Compostela. 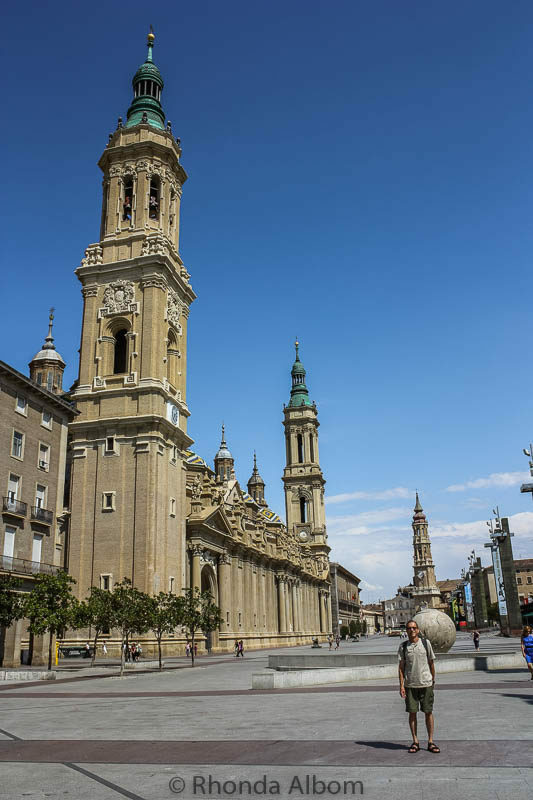 In fact, El Pilar is the second-most visited pilgrimage destination in Spain after Santiago de Compostela. This is our first view of the Basilica of Our Lady of the Pillar, shot from the car. Plaza del Pilar seen from the Fountain of the Hispanidad. Aptly named for the basilica, the plaza is called Pilar Square. In addition to El Pilar, we found a variety of statues, fountains, museums, and another major cathedral. This fountain sits on the plaza outside of the basilica. Looking to the left, we can see La Seo Cathedral and the large cube entrance to the underground Roman Museum. At the opposite end of the plaza sits the Fountain of the Hispanidad by artist: Samuel Magal, 2007. Modern shops and restaurants fill the streets leading to the Pilar Square. This is the entrance to Calle de Alfonso I, about midway across the plaza. 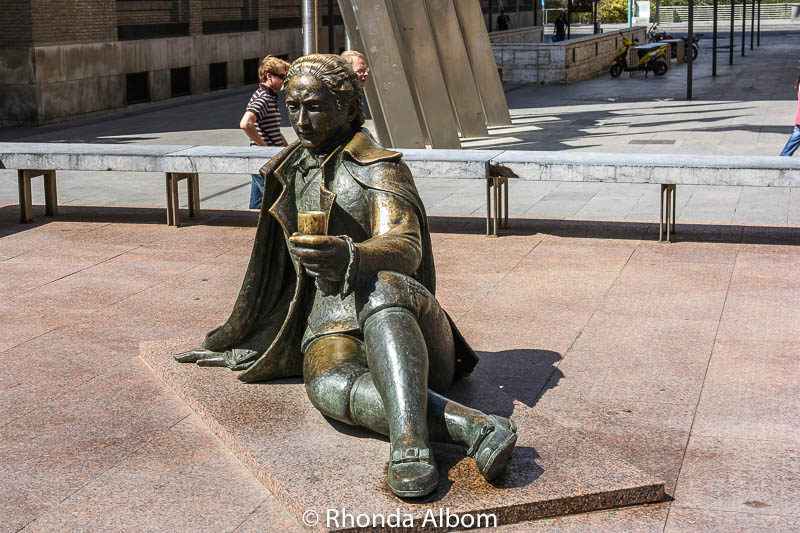 One of a series of sculptures dedicated to Francisco de Goya y Lucientes. One of Spain’s best-known painters, Goya grew up and studied painting while in Saragossa. The Cathedral of the Savior, also called La Seo de Zaragoza is the other main Roman Catholic cathedral in the city. The Cathedral of the Savior. A closer look at La Seo’s bell tower. A closer look at the clock on La Seo’s tower. The annual nine-day Fiesta del Pilar is one of Spain’s most celebrated festivals. The Basilica of Our Lady of the Pillar, La Seo Cathedral, and the Aljafería Palace (we didn’t visit here) are part of the Mudéjar Architecture of Aragon, a UNESCO World Heritage Site. We toured through Spain for two weeks, driving the long way between two home-exchange houses – the first in Catalunya, the second in Galicia. 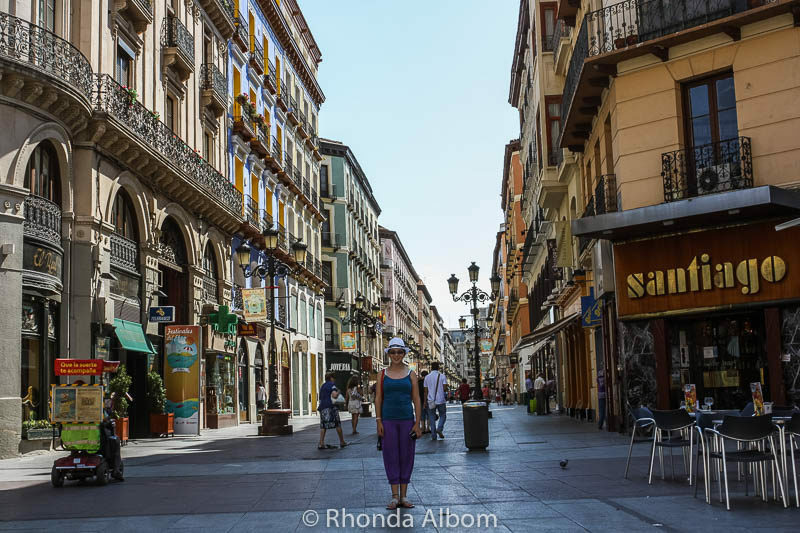 Our key travel stops in Spain were Saragossa, Madrid, Segovia, Toledo, Cordoba, Granada, and Vigo. In Portugal, we visited Evora, Sintra, Obidos, and Alcobaca. Have you been to Saragossa? Im sorry to say both your data and the one you link to are wrong, very wrong. First Aljaferia Palace is not Mudejar Art it is Islamic Art. Mudejar art did not replace other Architecture styles such and Gothic, Renaissance or Baroque, but it was a fussion between art styles, The East style mixed with the west styles. The Basilica of Our Lady of the Pillar far from Mudejar , it is mostly Baroque with some, The Cathedral of San Salvador , la Seo for us does have Mudejar art and mostly on the lft hand side of the Basilica, it has a stunnning wall full of mudejar mosaic, https://media-cdn.tripadvisor.com/media/photo-s/03/3b/0a/98/la-seo-del-salvador.jpg. The mudejar art that is Mudéjar Architecture of Aragon, a UNESCO World Heritage Site, is to be found in the city of Teruel , also in Aragon. 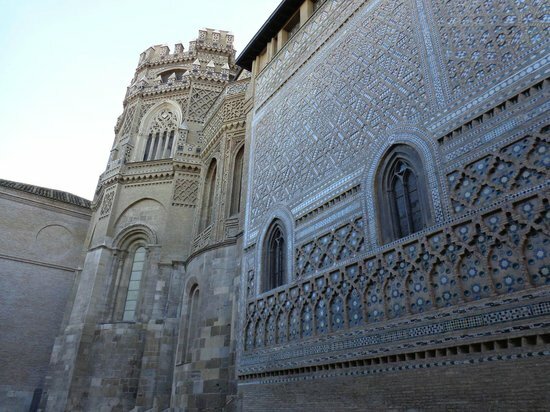 This unique artisitc style is only found the Iberian Peninsula, when is Spain three religions lived with respectfully, in Aragon are very proud of this unique style of architecture. It is a style of architecture that began in the 12th Century and lasted till the year 1610. Coexisitng with and combined with Romanesque art, Gothic art, Baroque and Renaissance. A wonderful post about this historic place. Great images as well. It is such an interesting place, and thanks. LOL – Yes, I feel that quite often myself, but Saragossa was the extreme, as we only had a few hours in an afternoon. I had been contemplating visiting Zaragoza during my visit to Spain in March but ultimately couldn’t fit it in. Looks like I definitely missed out. That’s quite an unusual looking clock but I like it. Those sculptures are nice too, quite playful. I didn’t realise Zaragoza was a pilgrimage destination, interesting. There is so many interesting and exciting things to see and do in Spain, No matter what you picked would have been a good choice. As a Roman Catholic, I think it would be wonderful to attend the festival or at least get to attend a mass at El Pilar and kiss the statue. Of course, the rest of Saragossa looks wonderful, too. I’m going to have a long To See list when I finally get back to Spain. Yes, you are and I am sure Zaragoza and Santiago de Compostela will both be on it. i understand that feeling of getting to a place and realizing that there is far more to it than you realized and you have not given yourself enough time there. Hopefully you’ll have a chance to go back. I was unfamiliar with this city but it certainly does seem worthwhile. I image it was a once in a lifetime experience. Quite a wonderful city. Loved the variety of sculptures and especially that earthquake style fountain. Such contrasts. I wish I had time to explore more than just this main plaza. 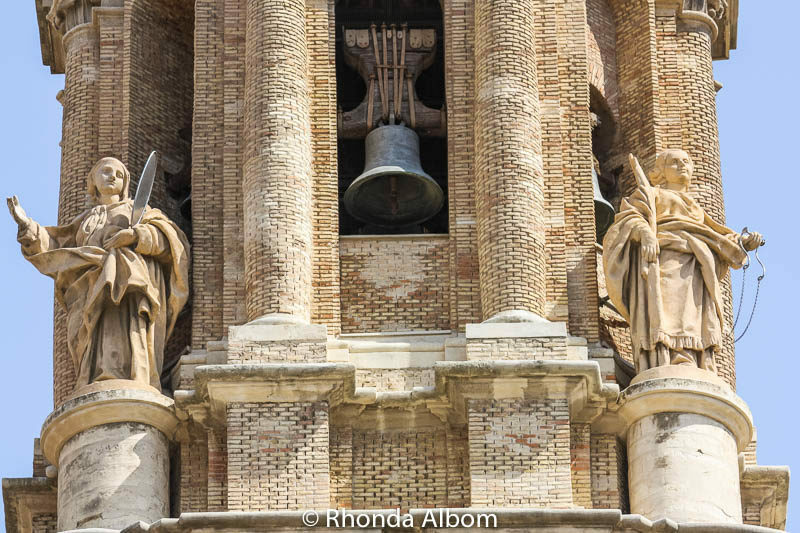 What a lovely photo essay on Zaragoza . I am reminded of my own trip to this windy city a few years back, It was great to reminisce. The bell tower of The Cathedral of the Savior, looks amazing as ever. So much detail, so little time. Aahhh Spain! 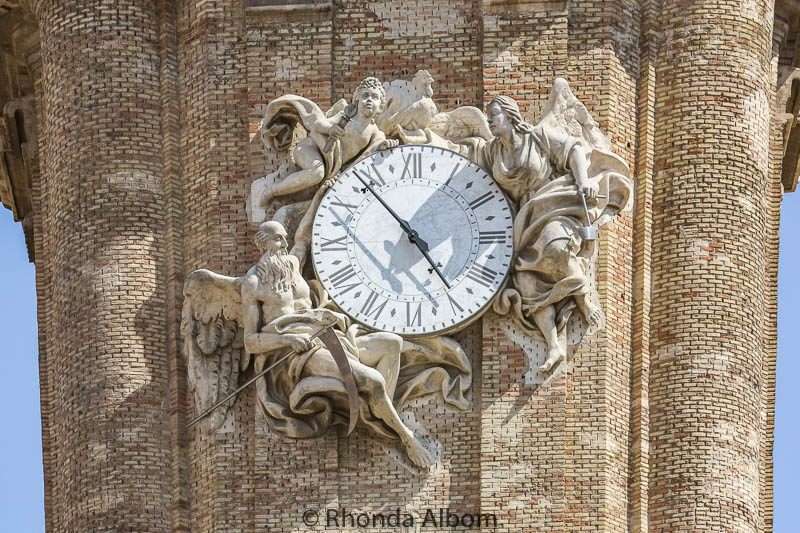 I remember our road trip back in 2010 on the Southern part of Spain, from Barcelona up to Madrid and down to Sevilla, Granada, Valencia and back to Barcelona again..Thanks for sharing it again, Rhonda. It brings back all those beautiful memories of Spain. We did the first half, the same, Barcelona, Madrid, Toledo, Granada, Sevilla, then we continued into Portugal, up the coast, across the top of Spain, into France and then back down towards Barcelona. What an unusual fountain of the Hispanidad by artist. Love your last two close up shots – beautiful. Thanks Jan. I don’t always shoot as many close-ups as I wish I had once I am home and review the photos. 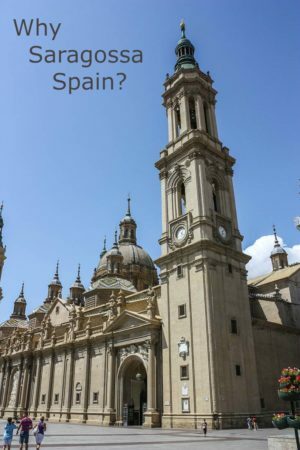 I lived in Spain in the past and Zaragosa is one of my favorites with all the pilgrims it offers! Such a lovely place indeed. We did two home exchanges in Spain, so lived there for a few months. We loved it too. The architecture is simply stunning! An interesting back story as well! Being history buffs, we would love to visit! How long did you spend exploring Saragossa? We only had a few hours as it was a stopped on our drive from Palamos (about 80km north of Barcelona, where we had a home exchange house) and Madrid. Clearly, it was not enough time, but better than missing it. 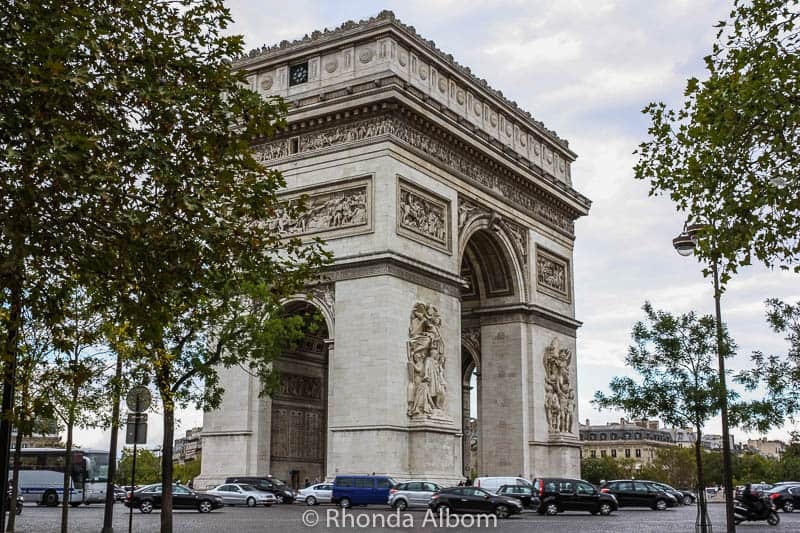 Thanks for sharing fabulous pictures of my city! What a fabulous place to be from. I do hope to spend more time in your beautiful Zaragoza some day. Thanks for sharing the links. That is a really awesome fountain, gosh so clever! The big one or the children with the fish? They were both pretty cool, but we did prefer the big one. It is pretty impressive, but remember, each time it was built for the statue. I’ve never heard of this town, but crazy how its so Roman. Beautiful pics. I found you from #weekendwanderlust and I linked up. Looking forward to reading more of the posts! The Roman Empire was huge, and traveling in Europe really drives that point home. I don’t know if there really is proper. I think the longer we stayed in each destination, the more we would find that we want to do. Spain is so filled with variety and intersting destinations. I am the same, only in this case we needed significantly more time. There is just so much to see in the world. Interestingly, I was never really that interested in religious history until I visited Spain. Spain is so beautiful and the architecture looks so intricate. I will visit there soon! I hope you love Spain as much as I do. How exciting. I love Spain, and would happily head back anytime. I seriously need to go back to Spain! I’ve only been to Barcelona but towns like this make me want to go back and see more of the country. Saragossa looks like a beautiful spot to explore and I love the legend associated with it! Barcelona is so full of life, like so much of Spain. Each region really has it’s own personality. The basilica and town are gorgeous and so clean! I love European countries where the streets look spotless. Sooo different from Egypt. LOL – I still haven’t made it to Egypt yet, but I would imagine it to be quite a contrast to Spain. A good friend of mine met through travelling is from Saragossa. I have never visited Spain, but your photos really make me want to pay her a visit now. Your friend would know I didn’t spend nearly enough time in the city. I definitely need to explore more of the Spanish mainland! I’ve only been to Alicante and the islands so far but it looks like the inland region has so much to offer! Between the two of us, we have seen it all. You have been to the only region we missed. I’ve never been to Saragossa. Definitely will put it on the list if I ever get back to Spain. Great architecture and I love the street sculptures. There is so much to see in Spain, and for you it would depend if you were sailing or overland. What a beautiful post and lovely photography. Spain retains so much of its regional heritage you almost have to visit each region as a separate trip. Add to that the various festivals and you have almost an entire summer you could spend wandering the Spanish countryside. Of course, there are worse things you could do in the world. Yes, we spent about 10 weeks in Spain, and it still was not nearly enough time. Great, as usual! I’m going to be going crazy in Barcelona next month because I’ll be thinking of all these other places you’ve posted about that I won’t have time to see. With limited time in Barcelona, personally, I wouldn’t head to Saragossa. I would spend my time exploring Barcelona. It is such a great city. We halted here for around 3 hours on our road trip from Madrid to Barcelona. Couldn’t explore much but the cathedral visit is memorable. We did exactly the same. 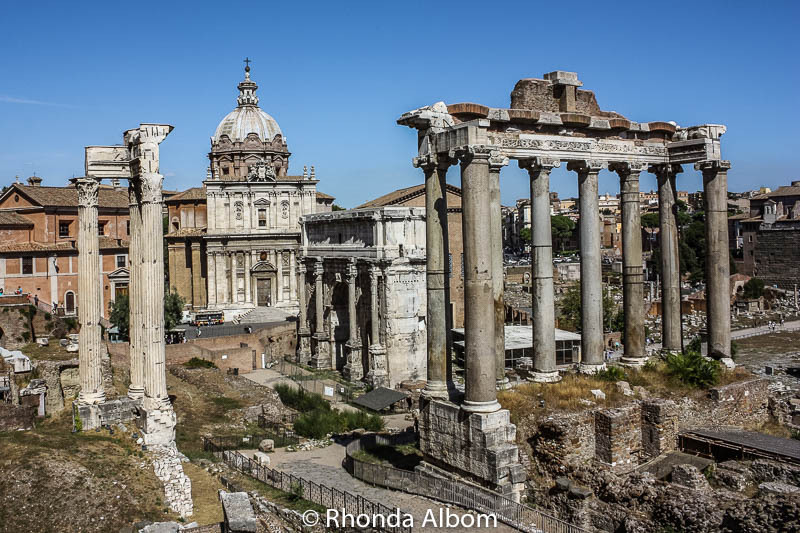 I would love to have seen the old Roman colosseum, the underground Roman museum, and had time to enjoy a meal. I love the domes. It give the church an eastern look. Is it the Moorish influence do you think? Yes, I love the Moorish influence. I think it provides my favourite architectural style. Saragossa looks amazing, I haven’t visited yet but it’s one of the Spanish cities I would love to visit. Now I know that I need to plan extra time here as there are so many things to see. The Basilica of our Lady is impressive and I like the story behind it. Even if you don’t have enough time, just stopping to see the Basilica and the statue is worth it. Thanks Hilary, that is my goal. Spain is one of my favourite countries in Europe. We have done two home exchanges there and spent quite a bit of time. No I haven’t been to Spain yet, but it is rapidly making its way to the top of my bucket list. What a lovely place Saragossa is! It caught me by surprise, as it was just a quick stop between Barcelona and Madrid. Great photographs. It appears you enjoyed yourselves very much. Sometimes you don’t have enough time to explore everything you want to see. I would have loved to visit the cathedral. Always so inspiring. We only had half a day here. If we did it all again I think we would have spent a night, seen some of the ruins, and had time for a long, lingering Spanish dinner. There is so much beautiful in these photos. You can feel the past just looking at these pictures. Wonderful Rhonda. Enjoy your Friday my friend. See ya. 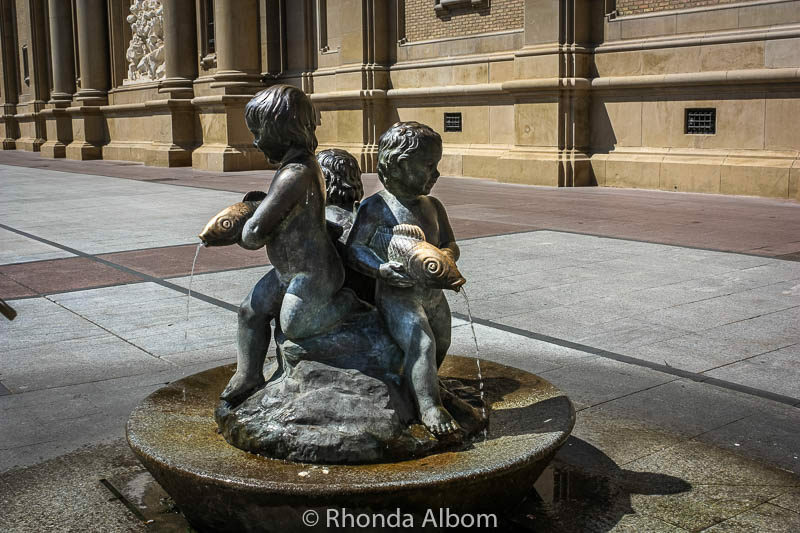 Lovely photos – that fountain is quite unique. I didn’t realize that Saragossa was such a pilgrimage site. In fact, I had never heard that before. It was a really hot day when we were there and we were all tempted to jump into the fountain. We only had half day, as we drove from Barcelona to Madrid. I hadn’t realised that Saragossa, and El Pilar in particular, was such a destination for pilgrims – did you manage to see the tiny statue? There’s clearly a lot to see there I can understand why you wanted to stay for longer. In the UK we here a lot about Santiago de Compostela but not so much about Saragossa. Yes, we saw the statue. Honestly, I hadn’t realised it either. Like you I was only aware of Santiago de Compostela. Zaragoza looks so beautiful! I’ve only heard of it and this makes me want to visit. That cathedral is absolutely stunning. Love the statues too. I wish I could have taken photos inside the cathedral. It was even more beautiful that the exterior. Were the girls exchange students? Is there a city, town or village we can drive to so we can get close to the trees? I know they are in the Alentejo region in Portugal and and we’re driving from Yaro. It looks great, I would love to spend time exploring Spain. Definitely doing shorter drives and staying multiple nights is the way to go in Europe, where there is so much to see in a small area. It’s not so far for you, can’t you take a ferry over? Spain is so much fun to explore.